This visible-light image, captured by NOAA’s GOES-East satellite, shows that the bulk of the former tropical storm Colin's clouds had already moved into the Atlantic Ocean by June 7 at 9:30 a.m. EDT (1330 GMT). New satellite photos show the former Tropical Storm Colin surging across Florida and into the Atlantic Ocean this morning (June 7). Colin churned northeast through the Gulf of Mexico before making landfall in Florida's "Big Bend" region late Monday night (June 6). 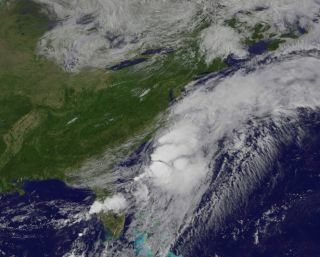 The storm soon popped free into the Atlantic, and by 8 a.m. EDT (1200 GMT) today, Colin was about 45 miles (75 kilometers) south of Wilmington, North Carolina, NASA officials said. The storm's progress has been tracked by a number of Earth-observing satellites, including NASA's Terra and Aqua spacecraft and the National Oceanic and Atmospheric Administration's (NOAA) GOES-East satellite. NASA's Terra satellite captured this visible light image of Tropical Storm Colin over the Gulf of Mexico on June 6 at 12:20 p.m. EDT (1620 GMT). Terra and GOES-East captured detailed visible-light imagery of Colin, while Aqua gathered infrared data showing that the maelstrom hosts strong thunderstorms, NASA officials said. According to the latest update from NOAA's National Hurricane Center (NHC) in Miami, which was published at 5 p.m. EDT (2100 GMT) today, Colin is moving northeast at about 40 mph (65 km/h), with maximum sustained winds near 60 mph (97 km/h). "This general motion is expected to continue through Wednesday night," the update reads. "Some slight strengthening is possible today and tonight, but gradual weakening is expected to begin on Wednesday." This false-colored infrared image from NASA's Aqua satellite of Tropical Storm Storm Colin shows the cold cloud-top temperatures (purple) of strong storms on June 7, 2016. The storm is expected to bring 1 to 2 inches (2.5 to 5 centimeters) of additional rainfall to far-eastern North Carolina through this evening, and 1 to 3 extra inches (2.5 to 7.5 cm) of rain across central Florida during the same period, according to previous NHC updates. Some parts of Florida, however, could receive up to 5 inches (12.5 cm) of additional rainfall. Colin never reached the status of hurricane, a term used for intense tropical cyclones with maximum sustained winds of at least 74 mph (119 km/h).